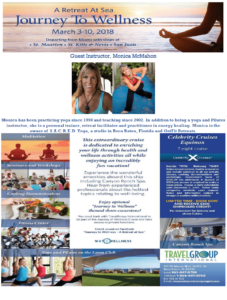 Join guest instructor Monica McMahon on the beautiful Celebrity Equinox for a Retreat at Sea, March 3 -10, 2018. 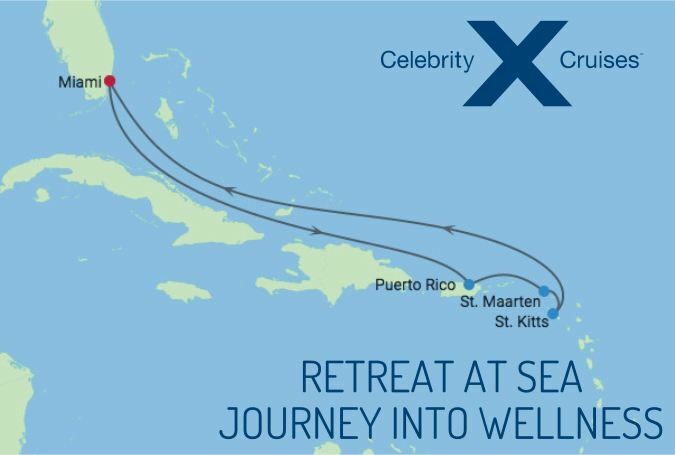 The seven day cruise departs Miami and visits St. Kitts & Nevis, St. Maarten, and San Juan. Experience the wonderful amenities aboard this ship including a Canyon Ranch Spa. Hear from experienced professionals about the hottest topics relating to well-being. As well as optional Journey to Wellness themed excursions in each port! Visit the Retreat at Sea Facebook page. Article by Michelle Tamblyn – originally appeared in the Pineapple Press. It seems like more and more people are offering yoga retreats. It is among the latest trends in health and wellness centered vacations. People are realizing the benefits of adding exercise and meditation to their daily routines, as well as making dietary lifestyle changes. Sometimes the experience of a retreat is just what you need to make a change. 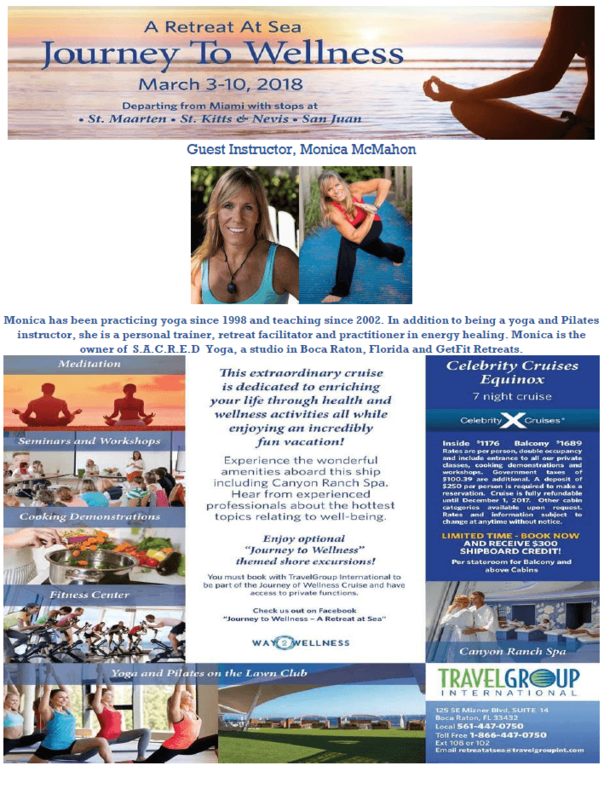 I was very excited to have the opportunity to co-facilitate a yoga retreat with Monica McMahon in New England this past fall. She is the founder of GetFit Retreats, a unique company specializing in custom retreats designed especially for you and your group. You pick the theme and elements for the retreat and an experienced team of facilitators will provide what you need based on your intention. Monica has a business background, having specialized in human resources management for PepsiCo and leadership/ organizational effectiveness for both small businesses and corporations. She has a bachelor’s degree in psychology and organizational development from UC Berkeley with a Human Resources Management Certificate from UCLA. She has experience and knowledge of group dynamics and how people absorb and process experiences. This is important, as a retreat will tend to take you out of your comfort zone. If you are considering going on a yoga retreat: it is a good way to shift the energy in your life. If you are wanting to make a change, but feeling stuck as to how to move forward, a retreat can give you clarity and direction. Maybe you are already in the midst of a transition, and have the free time or resources to do something special for yourself. A retreat can help with the process of letting go of the old so the new can move in. You might just need a break from your usual routine. A retreat is a place to disconnect from the everyday influences in your life so you can get in touch with your own truth. A yoga retreat is a great way to experience different places with a group of like-minded people, meet new friends, and have new adventures! You may find yourself trying something you never would have imagined you’d do, being able to let go of fears and old limiting beliefs. A retreat can be very grounding, connecting you with nature, and spending more time outdoors. There is plenty of time for introspection and meditation. When you are making time to connect with the space within and find your truth then it naturally shines out more into your experience. You will have a lot of fun! With a customized retreat from GetFit Retreats, you can choose the length and focus of the retreat as well as the location and main activities. Options range from mini-retreat local getaways to luxury world class resorts. The possibilities are endless. We are looking forward to creating a very special experience for you in Iceland in the fall of 2016! I hope you will join us! For more information about this trip or creating your own experience please contact Monica directly: monica@getfitretreats.com or call 208-866-6275.